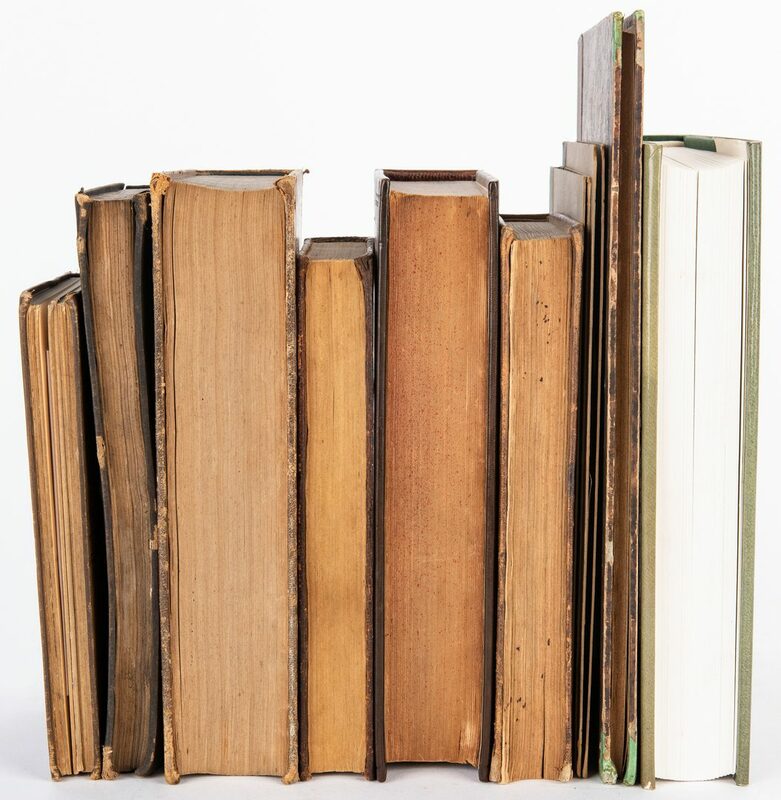 Ten (10) Midwifery/Medical books. 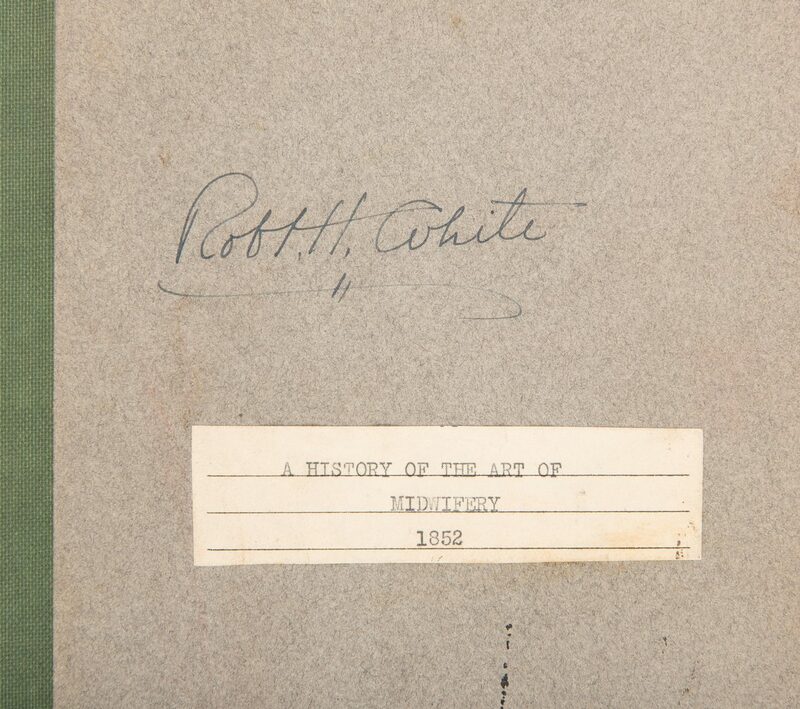 1st item: A Introduction to the Practice of Midwifery, Vol. 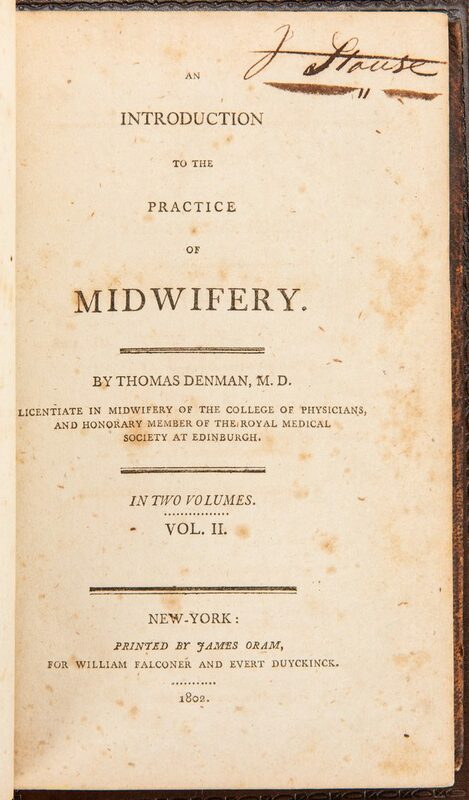 II, by Thomas Denman, M.D., 1802. Printed by James Oram, for William Falconer and Evert Dyckinck, New York. Octavo, 281 pages with index, rebound in brown leather with original covers and spine with gilt lettering, ink inscription from previous owner, top of title page. 8 3/8" H x 5 3/8" W x 1 3/8" D. 2nd item: Nouveaux Elements de Medecine Operatoire, Second Edition, by Alphonse A.L.M. 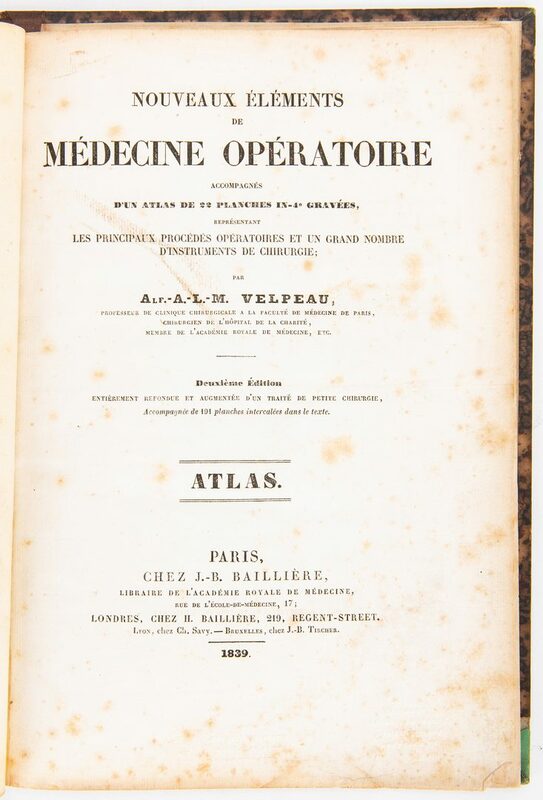 Velpeau, 1839. Published by Chez J.B. Bailliere, Paris, Chez H. Bailliere, Londres. 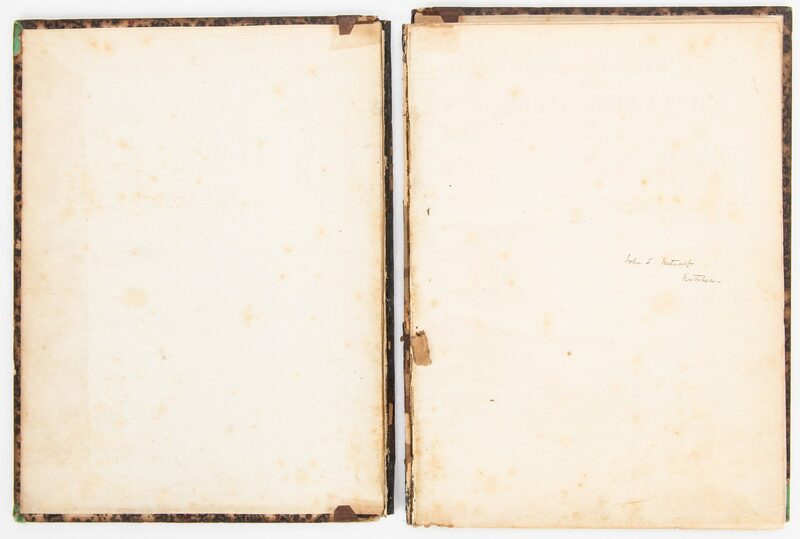 Quarto, 32 pages of text with 22 full page copper plate engraved illustrations, hardbound with quarter brown cloth with marbled paper with white lettering to covers, ink inscription from previous owner, front end paper. 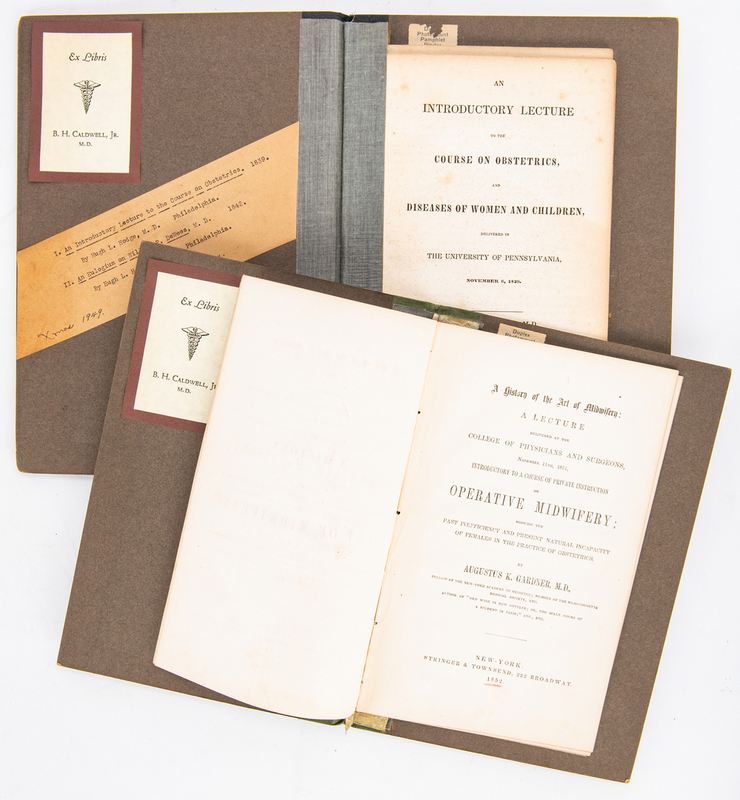 12 1/4" H x 9 1/8" W x 1/2" D. 3rd-4th items: Two (2) Hugh L. Hodge medical related pamphlets, including An Introductory Lecture to the Course on Obstetrics, and Diseases of Women and Children, Delivered in The University of Pennsylvania, November 6, 1839, by Hugh L. Hodge, M.D., 1839, printed by Lydia R. Bailey, Philadelphia, octavo, 20 pages, and An Eulogium on William P. Dewees, M.D. 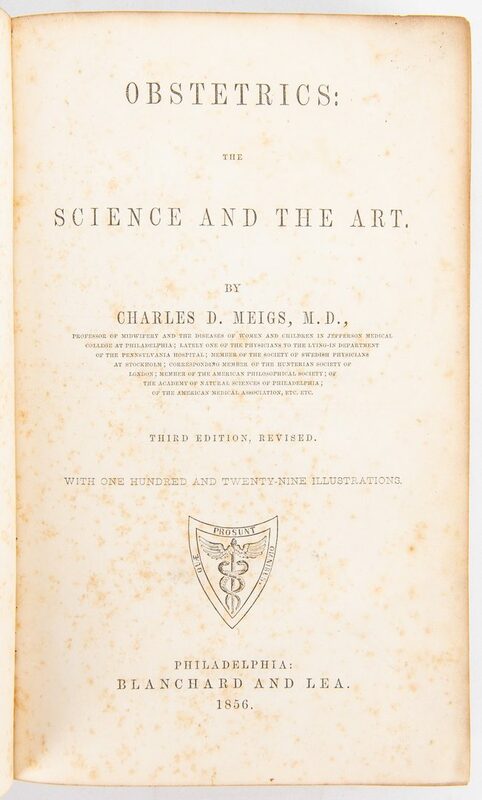 Delivered Before The Medical Student of The University of Pennsylvania, November 5, 1842, by Hugh L. Hodge, M.D., 1842, printed by Merrihew and Thompson, Philadelphia, octavo, 58 pages. Housed together in a quarter black cloth with grey card stock Duplex Photomount Pamphlet Binder, two (2) ex libris bookplates, one dated 1949, inside front cover. 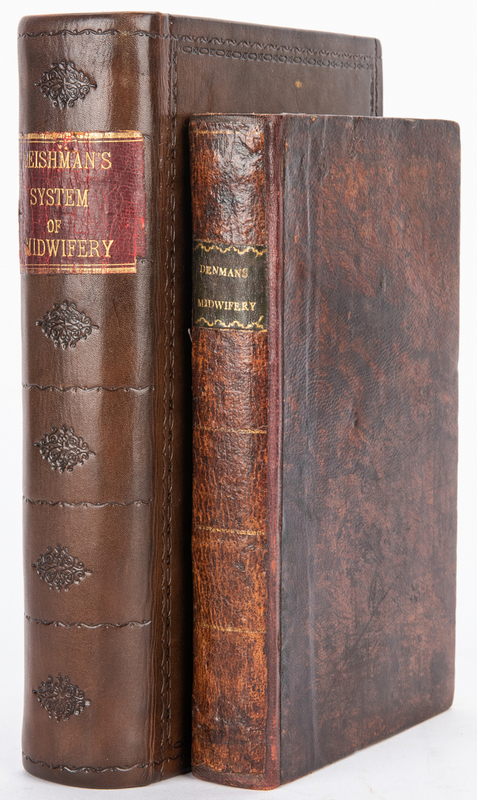 Pamphlets – 8 3/4" H x 5 3/4" W. Binder – 10 1/8" H x 7 1/4" W x 1/4" D. 5th item: A History on the Art of Midwifery by Augustus K. Gardner, M.D., 1852. Published by Stringer and Townsend, New York. Octavo pamphlet, 35 pages, housed in a quarter green cloth with grey card stock Duplex Photomount Pamphlet Binder, typed label with title and ink inscription from previous owner to cover, ex libris bookplate, inside front cover. 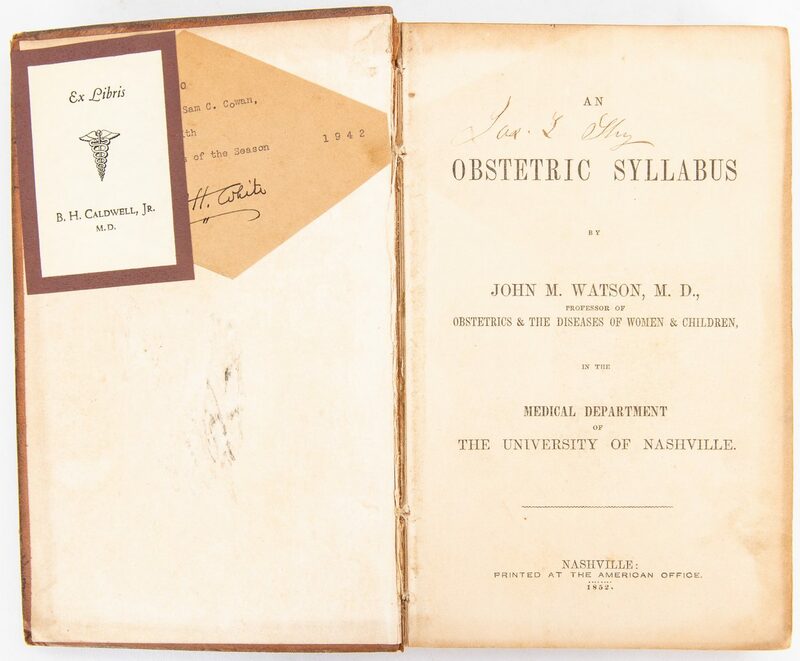 Pamphlet – 8 3/4" H x 5 5/8" W. Binder – 9 5/8" H x 6 5/8" W x 1/8" D. 6th item: An Obstetric Syllabus by John M. Watson, M.D., 1852. Printed at The American Office, Nashville. Octavo, 300 pages including index, hardbound in brown leather with gilt lettering to spine, ink inscription from previous owner, top of title page, two ex libris bookplate, inside of front cover. 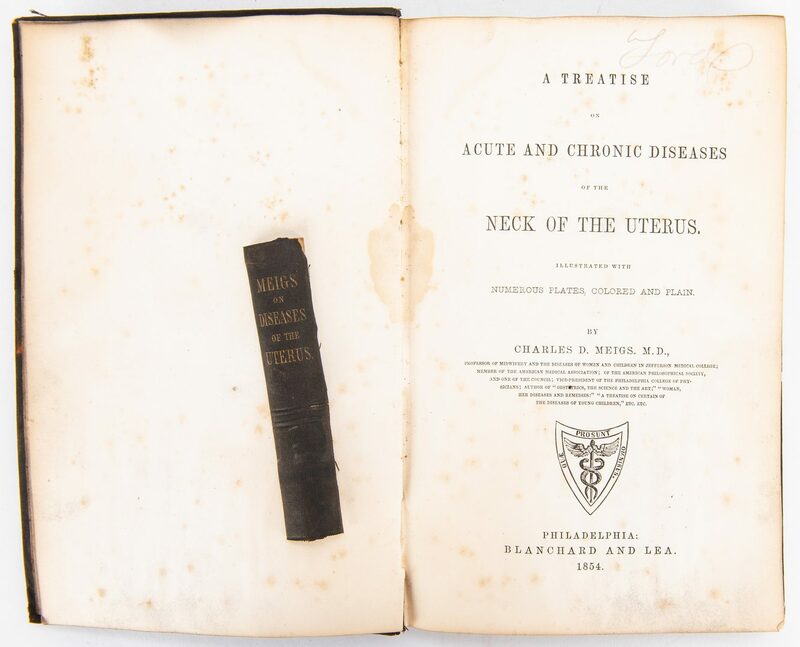 8 7/8" H x 6" W x 1 1/4" D. 7th item: A Treatise in Acute and Chronic Diseases of the Neck and Uterus by Charles D. Meigs, M.D., 1854. Published by Blanchard and Lea, Philadelphia. Octavo, 116 pages of text including index with 22 full page color lithographic plates with tissue paper guards and 32 pages of advertisements, hardbound in tooled black cloth with gilt lettering to spine, pencil inscription from previous owner, top of title page, inside of front cover, ex libris bookplate, inside of front cover. 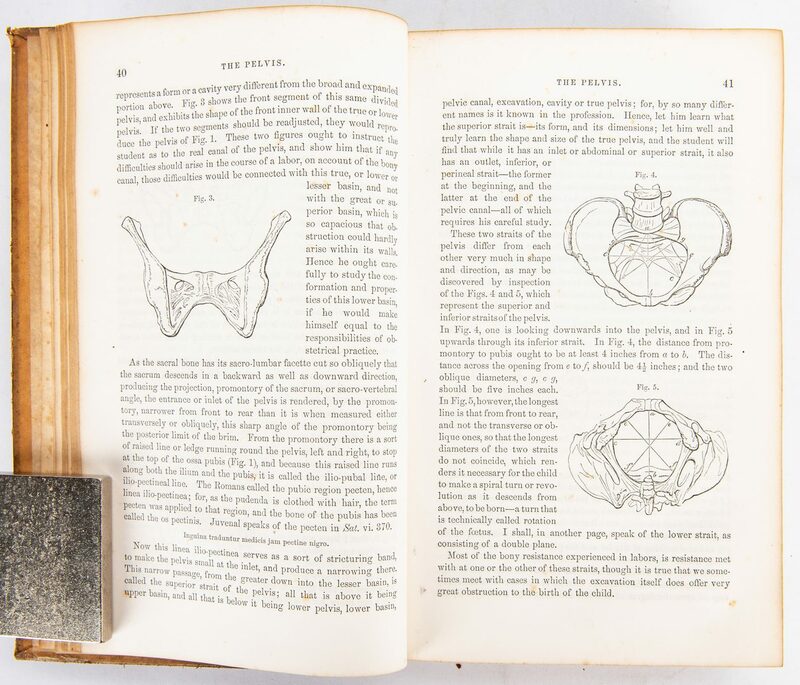 9 3/8" H x 6 1/4" W x 1 1/8" D. 8th item: Obstetrics: The Science and the Art, Third Edition, Revised, by Charles D. Meigs, M.D., 1856. Published by Blanchard and Lea, Philadelphia. Octavo, 758 pages including index, 129 illustrations, 32 pages of advertisements, hardbound in light brown leather with gilt lettering to spine, ink inscriptions from previous owners, one dated 1943, to brown paper pasted on front end paper and inside of front cover, ex libris bookplate, inside of front cover. 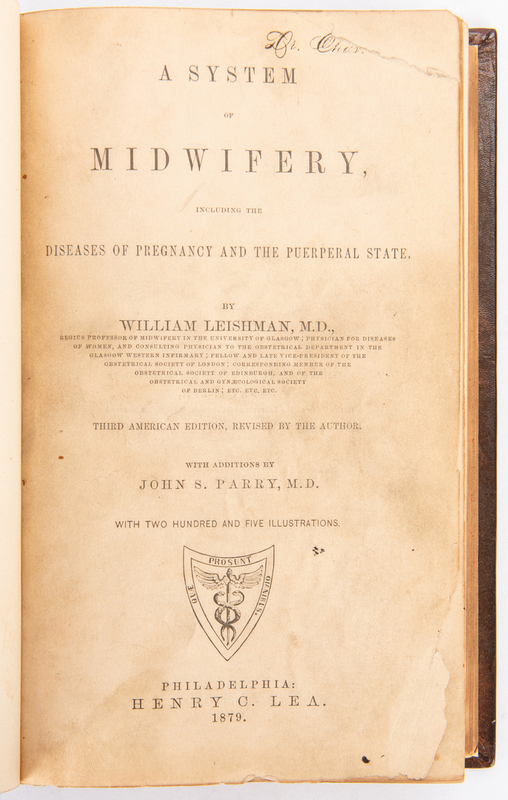 9 5/8" H x 6 3/8" W x 2 1/8" D. 9th item: A System of Midwifery, Including the Diseases of Pregnancy and the Puerperal State, Third American Edition, Revised, by William Leishman, M.D., with additions by John S. Parry, M.D., 1879. Octavo, 732 pages including index, 250 illustrations, 32 pages of advertisements, rebound in tooled brown leather with original gilt lettering to spine, ink inscription from previous owner, top of title page. 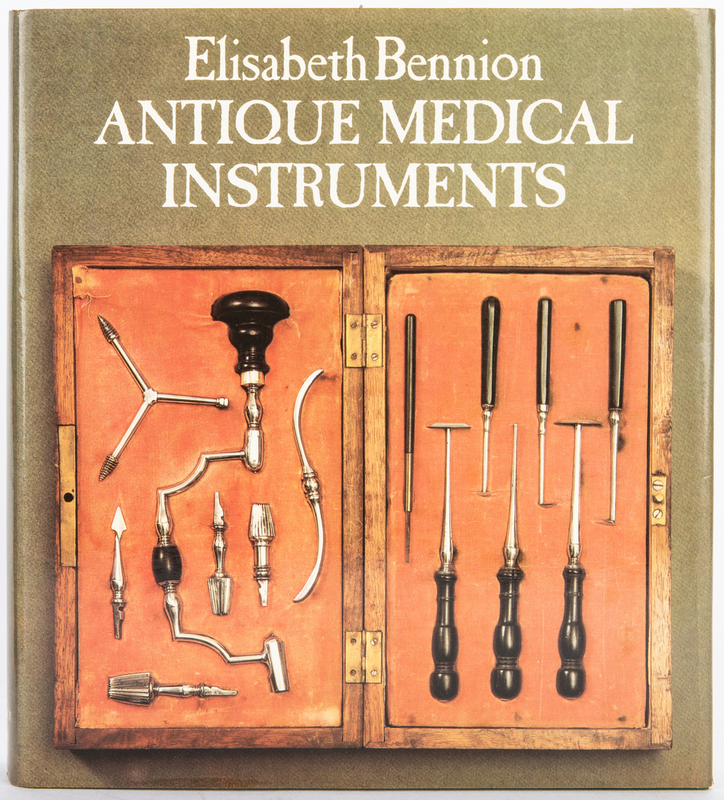 9 5/8" H x 6 1/2" W x 2" D. 10th item: Antique Medical Instruments by Elizabeth Bennion, 1980. Published by Sotheby Parke Bernet, London, University of California Press, Berkeley. 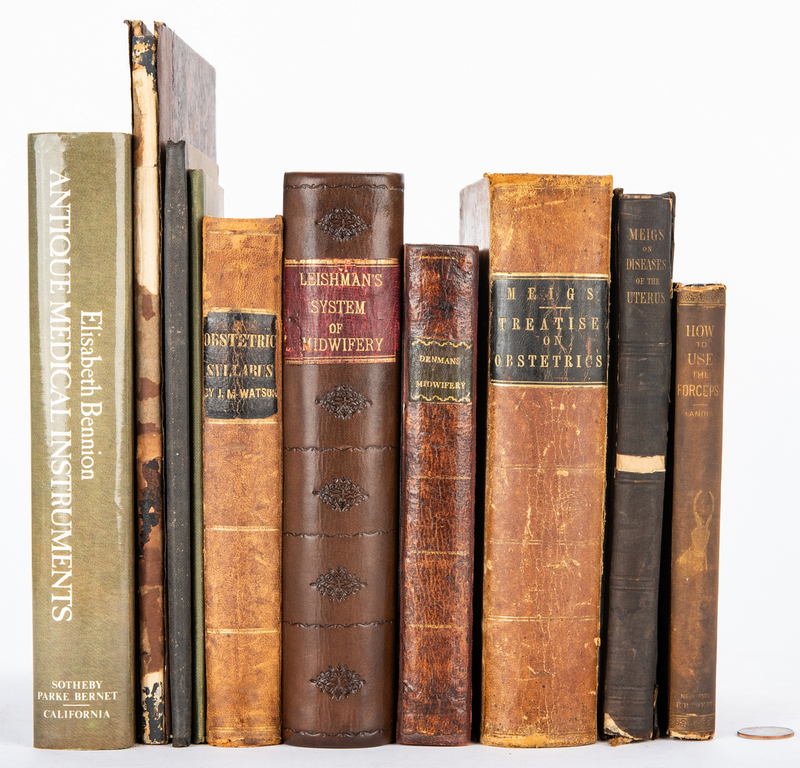 Octavo, 355 pages including bibliography, index, and lithographic illustrations, hardbound in green cloth with gilt lettering to spine, retail pencil inscription, top right of front end paper, includes dust jacket. 10 1/8" H x 9" W x 1 3/4" D. Provenance: The estate of Dr. Benjamin H. Caldwell, Nashville, Tennessee. 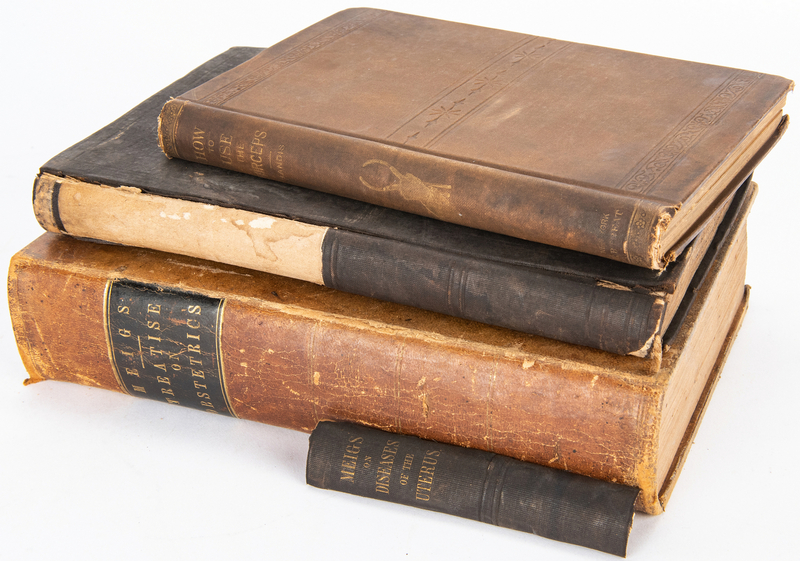 CONDITION: 1st item: Rebinding in good condition, original covers and spine with wear to be expected from age. Pages with foxing spots, toning/toning impressions, dampstaining, ink inscription from previous owner, top of title page. 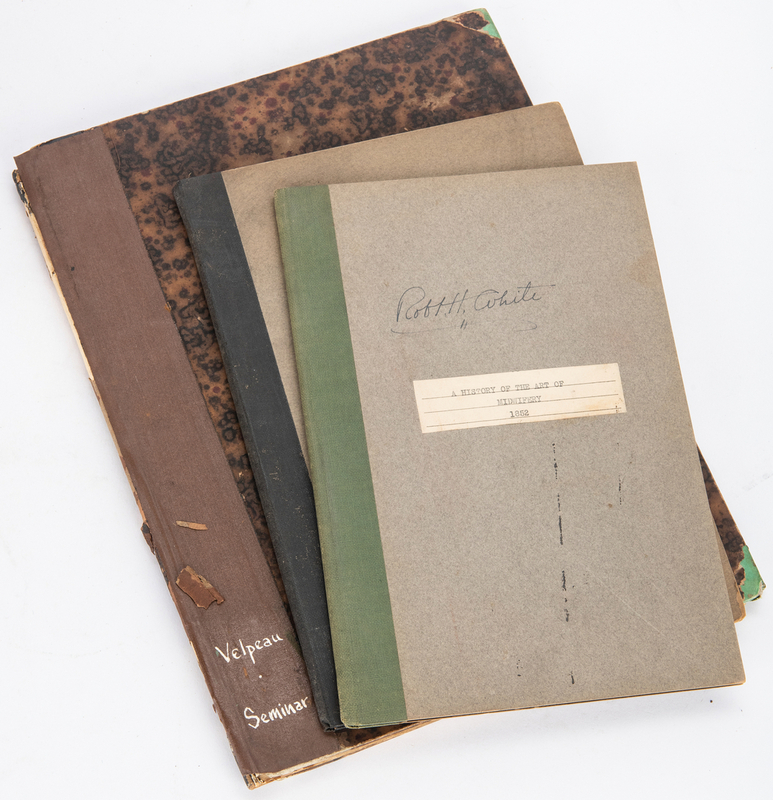 2nd item: Covers in fragmentary condition, covers separated from spine, scuffs, areas of loss, corners bumped. Pages with foxing spots, dampstaining toning, ink inscription from previous owner, front end paper. Plates are collated. 3rd-4th items: Binder with shelf wear, corners bumped. Pages with foxing spots, toning, two (2) ex libris bookplates, one dated 1949, inside front cover. Does not include front and back wrappers. 5th item: Binder with shelf wear, staining, typed label with title and ink inscription from previous owner to cover, ex libris bookplate inside front cover. Pages with foxing spots, toning, red pencil marks from previous owners. Does not include front and back wrappers. 6th item: Covers with shelf wear, scuffs, stains, areas of loss, cracks to spine, corners bumped. Pages with toning, foxing spots, dampstaining, pencil inscriptions from previous owners, ink inscription from previous owner, top of title page, two ex libris bookplates, inside of front cover. 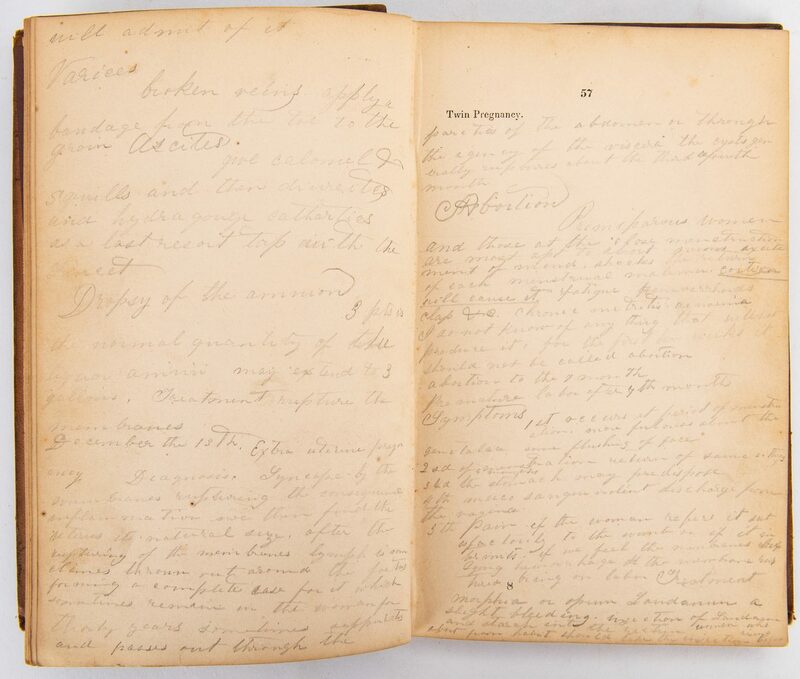 7th item: Covers with wear, dampstaining, areas of loss, including 4 1/2" x 1" area of spine with title, corners bumped. 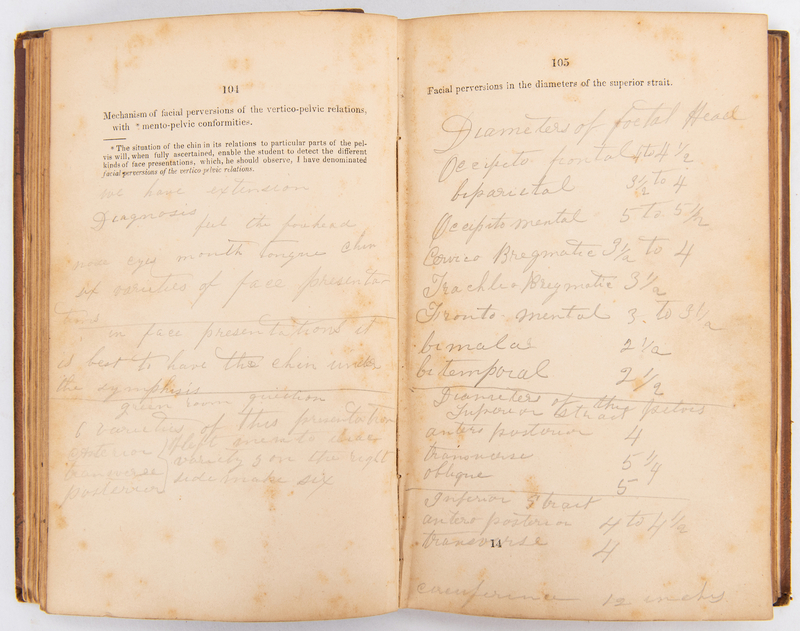 Pages with toning, foxing spots, dampstaining, pencil inscription from previous owner, top of title page, inside of front cover, ex libris bookplate, inside of front cover. 8th item: Covers with shelf wear, scuffs, stains, areas of loss, cracks to spine, corners bumped. 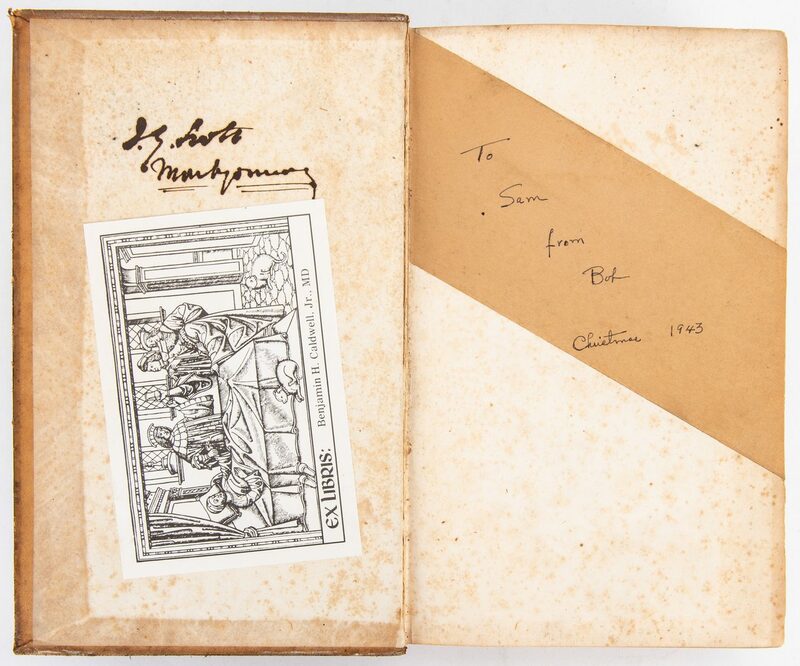 Pages with toning, foxing spots, dampstaining, ink inscriptions from previous owners, one dated 1943, to brown paper pasted on front end paper and inside of front cover, ex libris bookplate, inside of front cover. 9th item: Covers in overall good condition with scuffs. Pages with toning, foxing spots, dampstaining, acid burns, tears, creases, ink inscription from previous owner, top of title page. 10th item: Dust jacket and covers with light shelf wear, Pages in overall very good condition, retail pencil inscription, top right of front end paper.